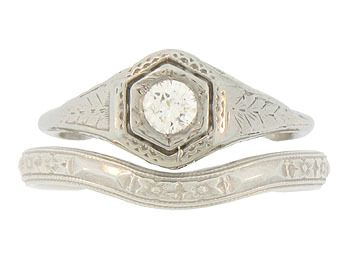 Pairs of impressed flowers press into the curling ribbon on the face of this 14K white gold curved wedding band. 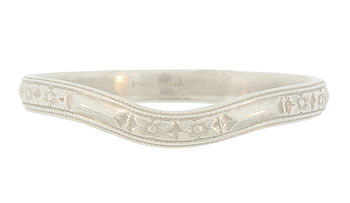 Distinctive milgrain adorns the edges of the curving wedding ring. Photographed here with R1005 (sold separately). 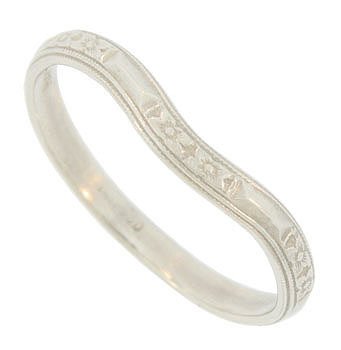 The antique style curved wedding ring measures 2.83 mm in width. Size 11 1/2. Cannot be re-sized, but we can order in other sizes. 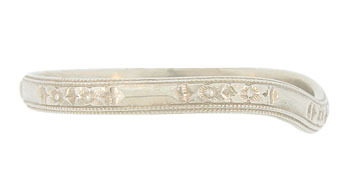 The antique style bands are frequently purchased as a set for $500, but are also available individually.